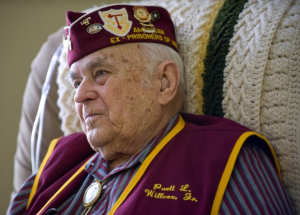 In November of 1950, the U.S. Navy sent Jack Cauble a one-way ticket to Bremerton, WA. He was to report for duty on the U.S.S. Essex, docked at Naval Station Bremerton. Jack would leave behind a young wife, Gean, and two small daughters, Jackie (2) and Olive (5 months). This would also mean that they would not be together for Christmas. Towards the beginning of December, Olive became seriously ill with pneumonia, and there was worry she would not survive. Messages were sent through the Red Cross to the Navy to try to get Jack back home on emergency leave. Checking in with the personnel office on the Essex, the Yeoman on duty informed Jack that the request had been denied. The Yeoman quoted the official response of the powers that be…”the child was not old enough to have formed an attachment to her” and there was no need for him to go home. Having taken extreme exception to that statement, Jack went sailing over the counter, intent on proving his displeasure to the Yeoman, who had the unfortunate job of delivering this thoughtless message. Luckily, a fellow sailor had gone with Jack that day, and managed to hold him back from throttling the Yeoman, and essentially keeping Jack out of the brig. With her husband 1900 miles away, Gean did what a mother does. She took care of her babies. Olive seemed to get better day by slow day. She and Jack had planned for her and the children to go to Washington, but with Olive’s fragile state, they were afraid the trip would not happen. Finally, the doctors gave Olive the all clear to travel. On the afternoon of December 21, 1950, a ticket in hand, suitcases packed, and babies bundled up, an anxious young country girl, who had scarcely been out of Howard County, TX, boarded a train and set out on a journey see her young husband. Apprehensive about the long trip with two small children, Gean’s unease must have been visible. A kind porter took it upon himself to check on her and the girls frequently. He would come by her compartment to see if she needed anything, or to carry or hold Jackie’s hand to the dining car. As Olive had been ill and had not had milk for quite a while, she was starting to get hungry. The doctors had said she could have some, and Gean was assured that she would be able to get it in the dining car, but the dining car was closed when she needed it. About this time, they were pulling into the depot in El Paso. Once again, the benevolent porter came to the rescue. He told Gean, there was no way that baby would make the long trip without some milk, and he would make sure she had some, and he knew just where to get it. He got off the train, went to a nearby café, and brought back milk for Olive. Twenty-eight hours after their departure, around midnight, the weary passengers reached Los Angeles. Jack’s uncle, Buck Rogers, picked up Gean and the girls, and drove them to his home in Whittier, CA. There they got a few hours sleep, then headed back to the station to catch the 8 am train to Portland, OR. Upon arriving in Portland, Gean learned that there would be a layover, due to weather. Tired and anxious, she pleaded with the ticket agent to get her on the next train to Seattle, because her husband was waiting for her. You see, Jack didn’t know that the train was delayed, and would be leaving soon for Seattle to wait for his wife and kids. Luckily, they were able to put Gean and the girls on the next train to Seattle, but she would come in to a different platform. She sent a telegram to the Essex, hoping to catch Jack before he left. Jack in the meantime, had arrived at the depot in Seattle, and settled in with a book to wait for his family. Deciding that the chairs were more comfortable in another area of the depot, he moved there, knowing he had enough time to get back to where Gean would come in. So, he waited for hours…..and hours. Gean arrives, and gets off the train to find that Jack is not there. Of course, she doesn’t know that he didn’t receive her telegram. It is late in the night, and they are tired and scared. She makes her babies as comfortable as she can and settles in to wait for her husband. At the other end of the station, Jack sat, reading his book. A station employee stopped and asked him if he was waiting for someone. Jack informs them that he is indeed waiting for his wife and kids. The person tells him that there is a young woman with two kids at the other end, but Jack assures them that it is not his party, because he knew what time they would be arriving. More waiting. Again, the employee urges Jack to just check and see if the young lady is his wife. Then he mentions that one of the little girls is wearing a little green jacket. Knowing Jackie had a little green jacket, he finally goes down to check, and there sat his covey of dove. Jack had gotten a room at a nearby hotel, because it was Christmas Eve, and would be too late to head back to base. Off they go, to get some rest before the last leg of their journey. The next morning, the four of them hopped the ferry for Bremerton. Ecstatic that their family was finally together and their long journey over, Jack escorted his ladies into the small, freezing base apartment that would be their home for the next three months. There on the table, sat a 15-inch Christmas tree, with a little string of lights, and two small teddy bears. One for each of his babies. When asked about their most memorable Christmas, this is the story they told. Gean kept the bears and the lights from that Christmas for many years, along with many other family and holiday mementos. One year, a tornado ripped through their farm in Iraan, TX, destroying the barn where the mementos were kept. Though the physical pieces of those memories are gone forever, Jack and Gean have kept them in their hearts and minds always. We have unfortunately lost primary access to our history collected through the years by a family member. A newly formed History Committee may be announced by TCFA President James Cauble at the 2013 reunion. The Committee’s goal will be to collect not only vital statistics on descendants of Peter Cauble and Mary Ann Rotan, but to collect photos, digital family momentos, and more. We are interested in where our kin lived, how they worshipped, and what their livelihood was. We will research why they may have moved to certain places … and what made them move on later. Often a genealogist will follow only the direct blood line of their own surname. We want to include lateral lines of Peter and Mary Ann Rotan Cauble, recognizing that their stories will be adding color and texture to our historic tapestry. We will find the war records of our menfolk, as well as their units and campaigns — and explore what life was like for the women left at home during times of conflict. If you are connected to Peter and Mary Ann Rotan Cauble and would like to participate, you can download a Family Group Sheet from the link above. It can be filled out and returned to the Committee at the 2013 reunion. The Scholarship committee is amending the CPT Todd Christmas Scholarship award guidelines and application for those who will be applying in 2012. New information will be added to the website shortly. 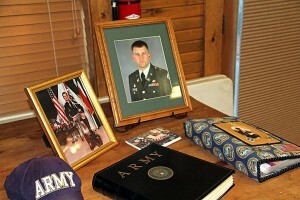 On the left is a memorial display set up in honor of CPT Christmas at the 2011 Texas Cauble Family Association reunion. Yesterday, I searched FlickR for any photos of the Cauble family, and I found Jim and Connie Waller’s photostream! What a gold mine it is! We are so lucky that they have taken the time to post and describe so many of the family reunion photos! Thank you, Connie and Jim! I am going to post links to some of their wonderful reunion photo sets here for us all to enjoy. If others have FlickR or Picasa accounts for photo sharing, please let us know!